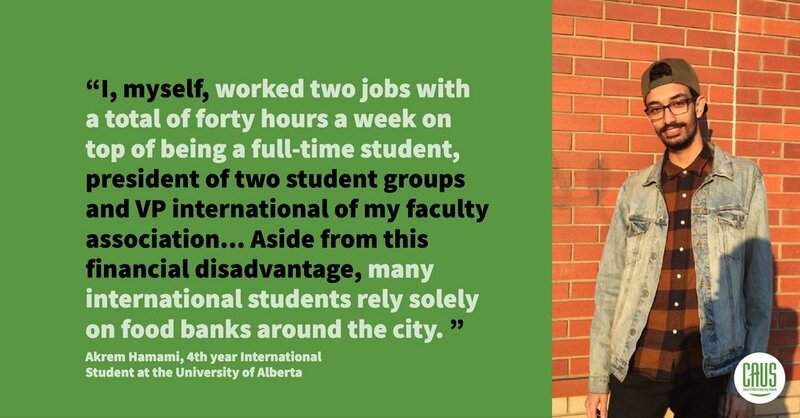 International undergraduates studying in Alberta are subject to high-cost tuition, limited employment opportunities, and precarious housing. These students are enmeshed within an intricate policy web linking federal, provincial, and institutional jurisdictions, leading to a diffusion of responsibility among policy-makers. This leaves these undergraduates without serious action taken to address the issues they face. Alberta has seen large growth in the number of international students attending universities in the province, but that influx has been exploited rather than nourished. CAUS encourages you to read the stories of international students and support our recommendations to encourage more of the worlds brightest to join us in Alberta. • Review the current International Graduate Category ineligible occupations list under the Alberta Immigrant Nominee Program to open more pathways to careers and citizenship.